Support built in microphone and speaker. Advanced multi streaming real rate time H.264. 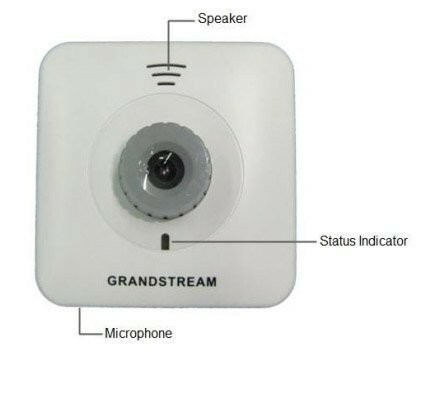 Support motion detection and alert notification. Grandstream’s GXV3615 series Cube IP Camera is a powerful next generation network camera with excellent performance in low light conditions; It features cutting edge H.264 real-time video compression with excellent image clarity, industry leading SIP/VoIP for 2-way audio and video streaming to mobile phones and video phones, integrated PoE (GXV3615), integrated Wi-Fi (GXV3615W), large pre/post-event recording buffer, and advanced security camera protection using strong encryption. 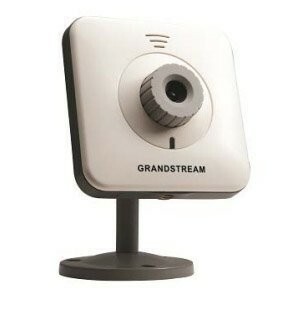 The GXV3615 series can be managed with GSurf, Grandstream's FREE video management software that controls up to 36 cameras simultaneously. It is fully compliant with ONVIF standards and offers a flexible HTTP API and a SDK for advanced integration. Image Sensor: 1/4", CMOS, 680H x 512V pixel resolution, excellent low noise levels and low-light sensitivity. Lens Type: 1/4", M12, f=4.50mm, F1.5, FOV=64. Max Video Resolution: 704x480, 352x240, 176x112; 704x576, 352x288, 176x144; 640x480, 480x272, 320x240, 256x192, 160x112. Max Frame Rate in Max Resolution: 30fps. Video Bit Rate: 16 Kbps - 2 Mbps. Network Protocol: TCP/UDP/IP, RTP/RTCP, RTSP, DHCP, DDNS, HTTP/HTTPS, SMTP, FTP, NTP, PPPoE. Wi-Fi (802.11b/g/n): Internal antenna (optional).